The IBJ Awards, held in November at The World Trade Centre Rotterdam was hosted by football legend Ruud Gullit. Amongst the Award Categories was the Environmental Protection Award in which RAM and Patrick Ports submitted their case study with exporting ore using the dust free containerized bulk handling system, which process involves the RAM Revolver and specialist container supplier to load the commodity into the ships hold. Shortlisted by the IBJ panel of judges, RAM and Patrick were proud of the fact that the bulk handling industry had recognised the need for such an innovative solution. Being proud winners of the award category for 2014, RAM and Patrick that winning such a category showed them that the bulk handling industry recognises the need for such an innovative solution in the way bulk is handled efficiently and no environmental impact. Australian Case Study: An ore exporting system that is environmentally ‘best practice’ for dust free operations. 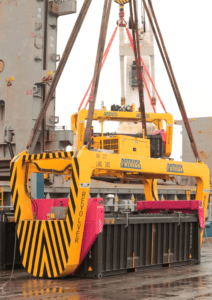 In 2013, Adrian Howard – General Manager, Business Development at Patrick Ports and Stevedoring was focused on winning more business for Patrick. A tender to export copper concentrate in tough economic times required some lateral thinking. Howard devised a new ultra low capital proposal that won the business, providing the customer with the use of new technology, the best dollar per tonne rate and an environmentally friendly solution. To date, Patrick has delivered an increase in productivity and cost savings for the customer.Challenged by a competitive market, Howard needed to “think inside the box” to win the contract. 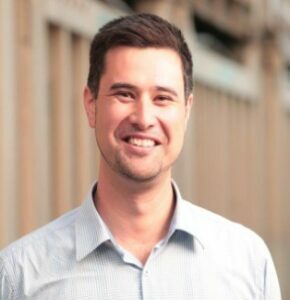 Based on the success of Containerized Bulk Handling (CBH) projects in Adelaide and Africa he decided to explore innovative loading solutions, as opposed to traditional bulk methods. To implement the new solution, Howard selected specially designed containers with lockable lids to integrate with A revolving spreader. The new system means that containers are stored at the port until vessel arrival. Copper concentrate is then loaded by the revolver into the ships hold, removing the need for a traditional concentrate storage shed and ship loader. 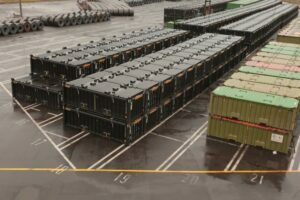 The sealed container system provides the customer with cost savings through reduced material losses, which is important considering the product is worth several thousand dollars per tonne. By securing the concentrate in sealed containers it means bypassing several transfer points between open stockpiles and conveyors, only exposing the material to the air at the bottom of an 18 meter deep hatch with a gentle tip. The clean process reduces employee and community exposure to potentially harmful dust emissions, whilst also adhering to strict environmental guidelines that ensure reduced spillage in sensitive marine ecosystems. Patrick has successfully delivered copper concentrate at Port Kembla for over a dozen vessel calls loading in excess of 150,000 tonnes, alongside other products such as steel, wind turbines and coke handled at the berths. The flexible CBH process also enables loading to be conducted at multiple berths operated by Patrick. Patrick’s unrivalled integrated logistics business offers a seamless trucking-rail-storage-port solution. This combined with low capital investment enables Patrick to offer a differentiated customer solution, when competitors provide traditional bulk solutions. Q: What was the main benefit to your customers? AH: Put simply the CBH process allows us to offer a dust free, environmentally friendly solution. The customer loves that the concentrate is controlled and contained from the pit to the ships hold. Q: Why did you choose the CBH process instead of traditional bulk? AH: We didn’t have the infrastructure in place for traditional bulk loading, and it’s not often that the lowest cost solution is also the best practice environmentally. Q: What flexibility does the system have vs. traditional bulk. AH: It’s ready to go quickly. We started the contract 4 months after order placement. A new bulk terminal takes years to construct and gain the necessary approvals. AH: They had a track record in delivering the first CBH system in Australia which has demonstrated reliability for nearly 5 years, and in many locations globally. Patrick is a part of the Asciano group of companies operating in over 40 ports across Australia and New Zealand with a national road and rail footprint in Australia. 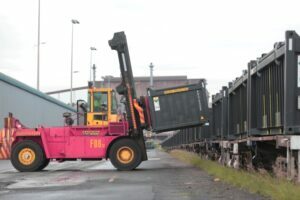 Asciano Limited (ASX: AIO) is the region’s largest combined rail and ports operator, bringing together the strength of Pacific National’s rail operations and Patrick’s ports, stevedoring and logistics businesses. With an annual turnover of $3.7 billion and 8,800 full time employees across Australia and New Zealand, the Asciano group of companies forms the backbone of Australia and New Zealand’s trade, handling and hauling the millions of tonnes of agricultural and resource commodities, retail goods, manufacturing products, construction and other materials that keep the region’s economy, businesses and households running. 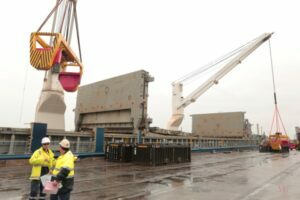 RAM Spreaders, part of the NSL Ltd group is one of the leading manufacturers and suppliers of container handling equipment for over 40 years have developed their environmentally friendly RAM Revolver® for dust free containerized bulk handling solutions.